Jewish Lights Publishing, 9781580236676, 256pp. Visionary solutions for a community ripe for transformational change--from fourteen leading innovators of Jewish life. 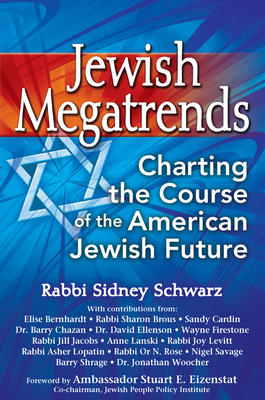 "Jewish Megatrends offers a vision for a community that can simultaneously strengthen the institutions that serve those who seek greater Jewish identification and attract younger Jews, many of whom are currently outside the orbit of Jewish communal life. Schwarz and his collaborators provide an exciting path, building on proven examples, that we ignore at our peril." Contributors--leading innovators from different sectors of the Jewish community--each use Rabbi Schwarz's framework as a springboard to set forth their particular vision for the future of their sector of Jewish life and beyond.